← Thoughts from a wet and windy Welsh hilltop. Last weekend Jane and I headed off to Glastonbury for a few days. It’s an unreal place. If ever you needed to visit a personal transformation coach, an angelic reiki practitioner or a shamanic hairdresser, make for Glastonbury. It would be easy to sneer at the apparent pretentiousness of it all, but that would be unfair. While there may be some charlatans involved, I’m sure many of these people are quite genuine in their thinking; and I sometimes think how comfortable it must be to live according to a ready-made belief system. It was curious to note the vigorous campaign for the retention of the last remaining bank (Barclays, if I remember correctly….) in the town, though. An extensive area of former peat workings near Glastonbury has been reclaimed to create a cluster of wetlands and reedbeds, now known as the Avalon Marshes. These are home to several rare bird species, notably bittern and great white egret. The latter was fairly prominent at the Ham Wall RSPB reserve, and I photographed one on a beautiful, still, winter’s morning with warm light and a hint of frost on the ground. The former lived up to its reputation for skulking. But arguably the biggest draw on the Avalon Marshes in winter is its huge starling roost, which I spent three evenings trying to capture. For roosting, the birds have a very large area to choose from, and they can move from one site to another on a daily basis. Even the local birders and photographers admit to being unable to predict what they are likely to do next. 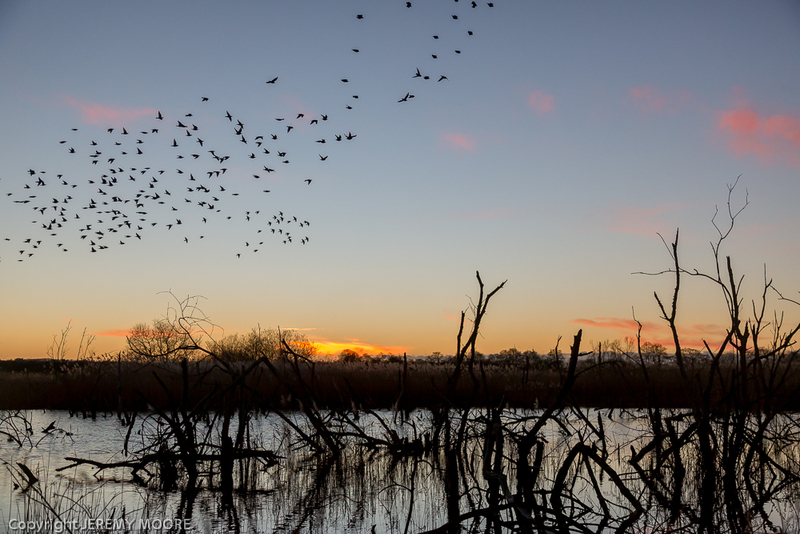 On my first visit I found a likely looking foreground at sunset and hoped a flock would fill the sky with interesting shapes. Needless to say it didn’t work out how I had hoped, but there was the above; I’m not sure yet if the image works or not. On the second night, from a different location, I watched as huge flocks gathered over farmland and in trees to the east against a dull background; and later, with mounting disbelief, as a continuous stream of starlings moved from one section of reedbed to another. The process lasted some 15 – 20 minutes; there must have been millions of birds altogether. But it was a frustrating encounter; they flew too low over the ground to photograph successfully. On the third night I sought out the trees where they had gathered the previous evening but again the results were disappointing. For the last couple of months my camera bag might have been a door stop for all the use it has had, so it was good to pick up the camera again….. even if I could barely remember what some of its buttons were for! But the experience did remind me how important it is to be familiar with the controls of your equipment. A few seconds delay and confusion can mean the difference between getting the shot and missing it. And which shutter speed would blur the movement of birds in flight most successfully? I just couldn’t remember. But there is one thing about trying to photograph wildlife – it teaches you patience. To follow Tales from Wild Wales, scroll down to the bottom of the page and click Follow. This entry was posted in Uncategorized and tagged aberystwyth, avalon, bird, marshes, murmuration, murmurations, photography, starling, starlings, wales, wildlife. Bookmark the permalink. I love starlings and though we don’t have anywhere very close where you can see these wonderful murmurations, I do think we’ve seen an increase in numbers recently, which I welcome. Your images are stunning. According to this map, there is, or has been, a starling roost somewhere in central Newcastle and a couple not far away. But the map may be out of date, or the birds may have decided to go somewhere else. It’s probably worth spending some time searching out a local site. Your county bird recorder may know. Thanks Jerry, should there be a link to the map? I do remember the starlings swooping around the buildings in Newcastle though I never saw an actual murmuration. The birds must be roosting somewhere locally. They gather in big or small flocks and fly to the roost site , sometimes flying around together above it. That must be what you’ve seen. People use the word “murmuration” now but I’m not sure what it means; it suggests a murmuring sound. You can hear their wingbeats as they fly past in large numbers; this can be quite dramatic, especially if a large flock of them suddenly takes off together. But only when they land in the roost do they start chattering. So I ‘m not sure where the murmuration comes in. Perhaps I’m being too literal! Only occasionally do they seem to perform those amazing swirling amoeba-like displays which the best photographs and videos show. Is that what people mean by a murmuration? They seem to be provoked by the presence of a predator (eg a peregrine) and may be some kind of defensive or avoidance behaviour. Or there may be some other reason……. But it seems to be a matter of chance whether it happens or not. Usually it doesn’t, unfortunately. I will try to post the link again. If you contacted some local birders or perhaps find a local bird forum on the internet they would help you find a site.